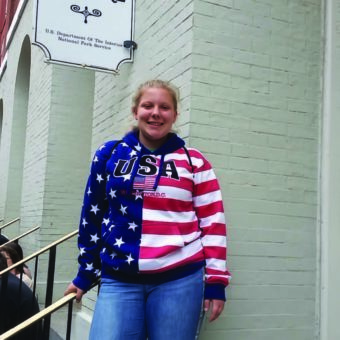 Dayna Harris enjoyed her visit to Ford’s Theatre in Washington, D.C., as part of the Washington Youth Tour trip in June. 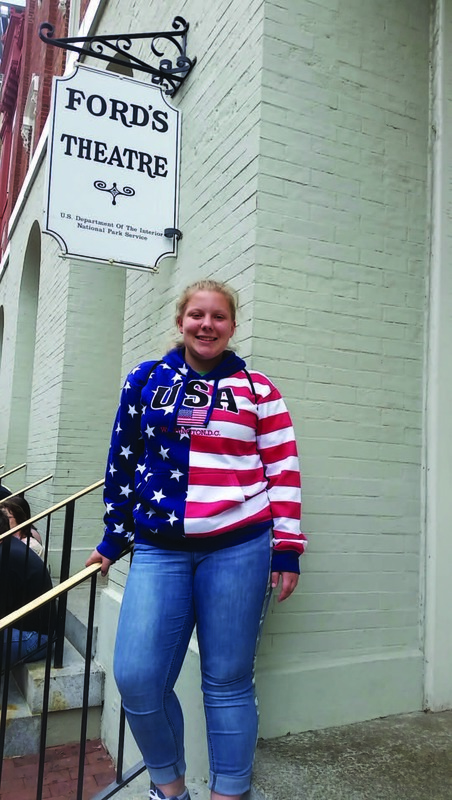 With her interest in history, Dayna Harris didn’t have to think twice about applying for the National Rural Electric Cooperative Association’s Youth Tour. Dayna, who will begin her senior year at Cottage Grove High School this month, wants to be a history teacher after she finishes college. The Youth Tour is all about history. 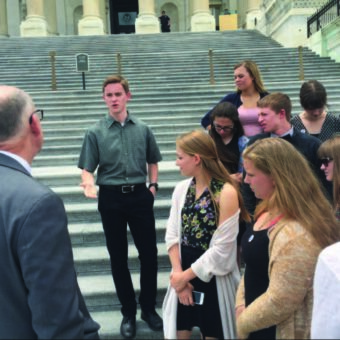 High school students traveled to Washington, D.C., where they visit monuments, memorials, meet with their state’s U.S. senators or representatives, and listen to featured speakers. Dayna first saw the application information for the tour in Ruralite when she was a sophomore. A year later, when she was a junior, she applied through Lane Electric Cooperative. She says she was ecstatic when she was informed she had been selected to make the tour and would be sponsored by Lane Electric. Liz, Dayna’s mother, says her daughter was thrilled to be selected. “When she called me right after being told, I could hear the smile over the phone,” Liz says. “I was so happy for her. Lane Electric has sponsored students from its service territory for the Youth Tour for 40 years. Susan Knudsen Obermeyer, president of the Lane Electric board, helped select Dayna for this year’s trip. “Dayna is a perfect candidate for us to sponsor,” Susan says. “We heard about her hunger for learning and her kind, thoughtful nature. She has the vision to see the role of electricity in adapting to the challenges of the future. This will fit in nicely with her goals. Dayna will make the most of her experience. This year’s trip was June 7-14. Dayna traveled in a group of 26 students and five adult chaperones representing rural electric cooperatives from four western states. In Washington, D.C., about 1,800 students from co-ops in 43 states participated in the tour. Dayna says the trip forced her out of her comfort zone. She didn’t know anybody else making the trip, so she had to talk and get to know others. She says that was a good experience. “You’re kind of thrown together, but then you get to spend time and get to know people from all over the state, from all over the country,” Dayna says. Students visited the National Archives, where they viewed the Declaration of Independence and the U.S. Constitution; the Smithsonian Institution, a group of museums and research centers; the Newseum, a museum that focuses on free expression, the First Amendment to the U.S. Constitution and the evolution of communications; Ford’s Theater, where President Abraham Lincoln was assassinated; the Holocaust Memorial Museum; and the National Mall. Dayna says riding the subway was also a unique experience. She had never been on one. “To see all these people crammed into this tube thing, and then to get in one, it was crazy,” she says. Liz and Brandon Harris were able to talk to their daughter every day during the trip. They say she was thrilled with every new experience. Students met with Oregon legislators, including Rep. Greg Walden, far left. “Getting to see the landmarks, to hear about the history, to see how the government works, to hear about Congress, to get to go there and experience it for kids at this age was an incredible opportunity,” Liz says. “We got to hear about her daily adventures, and she was just in awe of all the different things they got to do, all the people they got to meet. When the trip ended, Dayna says it was sad to leave her fellow travelers who had been strangers a week earlier, but were now friends. A couple of online group chats have been established, allowing Dayna to keep in touch with several of her new friends from the trip. She is now looking forward to her final year at Cottage Grove High School and then on to college. She is considering attending Boise Bible College in Idaho, or staying closer to home and attending the University of Oregon in Eugene. “I’m keeping my options open at this point,” Dayna says. Along with her major in history, she is considering a minor in Spanish. She has taken five years of Spanish classes and made a 10-day trip to Spain with members of the Cottage Grove High School Spanish Club in late June. “It would be pretty awesome to come back and teach in my hometown,” Dayna says. She would then be able to share her experiences from the Youth Tour with her students, explaining that even though a person might be from a rural area, there are still opportunities available to travel and visit historical landmarks in the United States. “It was an eye-opening trip for me, a really awe- some experience,” Dayna says. “I can’t thank Lane Electric enough for making it possible. 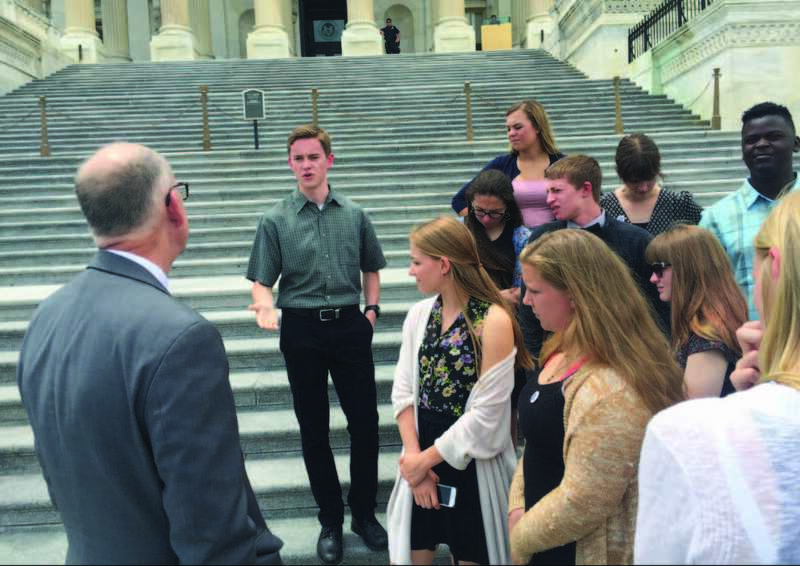 The Washington Youth Tour has coordinated visits to Washington, D.C., for high school students for a week in June since the late 1950s. The goal is to give students a close-up look at their nation’s capital, to learn about the political process and to interact with their elected officials. Nearly 50,000 students from rural areas and small towns across the U.S. are now alumni of the Youth Tour.